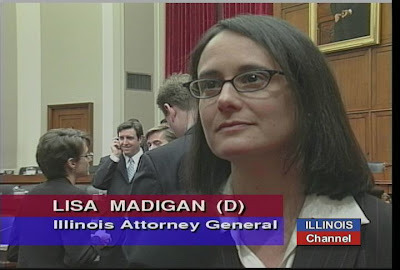 Last week I reported about a scorching letter IL Sen. Tim Bivins (R-Dixon) recently sent to Attorney General Lisa Madigan about the status of her reported investigation of the Save-A-Life Foundation (SALF). Undoubtedly you agree that we have a duty to assure the public that the millions in public and private dollars SALF obtained weren't misappropriated. The former Lee County sheriff wants investigations and audits of these groups, he said. Based on a March 2 reply to Sen. Bivins, the Attorney General disagrees. What's more, the AG's letter, signed by Chief Deputy Attorney General Brent Stratton (page down), could serve as a blueprint for teaching nonprofits how to get away with ripping off Illinois taxpayers. (Where) grants from state agencies are involved, the (Attorney General's) Office typically becomes involved through referrals from the granting agencies. We have never received a referral from a state agency raising any concerns regarding a grant made to SALF. ...SALF was registered as an Illinois charitable organization with this Office from 1994 through 2009, during which period it filed complete annual reports accompanied by audits when required by law. In September 2009, SALF filed articles of dissolution with the Secretary of State. It then filed a final report with this Office in April 2010. When we first received complaints in June, 2010, SALF was no longer an active charity, for which the concerns about on-going fund-raising and the protection of charitable assets are paramount. A. Nonprofit XYZ is awarded millions of dollars from IL state agencies, but none of the funding agencies file complaints with the Attorney General. B. XYZ closes it doors. C. As far as the Attorney General is concerned, the millions of tax dollars awarded to XYZ are water under the bridge. The principals at XYZ can rest easy for another reason. Even if their organization has been the subject of dozens of media exposes all over the country (as SALF has been), Illinois' top law enforcement officer apparently won't lift a finger to find out what happened to the millions of taxpayer dollars awarded to XYZ. I am writing in response to your letter regarding the Save-A-Life Foundation (SALF). First, allow me to correct what may have been a miscommunication or misunderstanding regarding this Office's investigation of Ms. Spizzirri's current whereabouts. Without trying to reconstruct your conversation with Mr. Kenyatta of this Office, let me assure you that we have been aware of Ms. Spizzirri's whereabouts since she moved to California. Her current address, which we certainly have, does not explain why our investigation of SALF is ongoing. As you acknowledge, we do not discuss the details of an ongoing investigation, so we will not be able to provide you with more information about the status of our investigation. But, let me emphasize that, as with all such allegations against charitable organizations, we took these allegations very seriously and immediately initiated an investigation of SALF regarding the financial and other reporting issues raised by the complainants. Second, as background, please understand that this Office's Charitable Trust Bureau has as its primary mission the protection of charitable assets held by charitable organizations registered in Illinois. The Bureau does not have jurisdiction to investigate or prosecute criminal conduct, which would fall under the jurisdiction of local State's Attorneys, but rather enforces the Charitable Trust Act through civil court actions. Additionally, where grants from state agencies are involved, the Office typically becomes involved through referrals from the granting agencies. We have never received a referral from a state agency raising any concerns regarding a grant made to SALF. Third, as further background information, SALF was registered as an Illinois charitable organization with this Office from 1994 through 2009, during which period it filed complete annual reports accompanied by audits when required by law. In September 2009, SALF filed articles of dissolution with the Secretary of State. It then filed a final report with this Office in April 2010. When we first received complaints in June, 2010, SALF was no longer an active charity, for which the concerns about on-going fund-raising and the protection of charitable assets are paramount. We hope that this information is helpful. Please feel free to contact me at 312-814-4499 with questions you may have regarding this matter.